Cannabis is a drug produced from the Cannabis sativa plant (commonly known as hemp) or Cannabis indica plant, which is related to nettles and hops. It's believed to have originated in the mountainous regions of India, and grows wild in many parts of the world. The plant contains more than 400 chemicals, including cannabidiolic acid, an antibiotic with similar properties to penicillin. The different chemical derivatives of the plant can be used for medicinal or recreational purposes. The recreational drug cannabis comes in many forms - herbal (dried plant material), resin, powder and oil - and is known by many slang terms, including weed, pot, grass and hash. In the UK, cannabis is a Class B illegal drug. Cannabis is most widely used as a illegal street drug for its relaxing properties. It is usually rolled into a cigarette known as a joint, but can also be smoked in a pipe, brewed as a tea or mixed with food. The main active ingredient in cannabis is tetrahydrocannabino (THC). 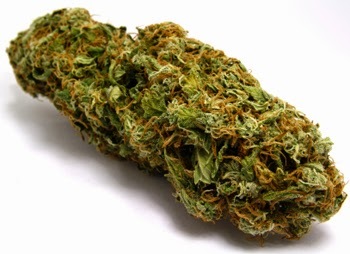 One type, skunk, can be particularly potent as it contains two to three time as much THC as other types. has mild hallucinogenic effects, causing a distortion of realitymakes some people become more animated releases inhibitions, making people talkative or giggly can cause nausea in some people (despite the fact that cannabis can have an anti-nausea effect), while it quite often makes others feel hungry. Cannabis or its derivatives may also be used as a medical treatment. There is some scientific evidence to suggest it may be useful in a wide range of conditions. But the complex nature of the substances contained within the plant makes it difficult for medical research to establish clearly its safety or efficacy, so its effects are far from proven or well-understood. The active chemicals within cannabis (known as a group as cannabinoids) are gradually being identified and wide-scale trials testing the safety and efficacy of these cannabis extracts (or synthetic forms of them) are currently underway in the UK and elsewhere. For instance, cannabis appears to be able to help reduce the side effects of chemotherapy treatment, although not more so than other already established medications. The drugs used to treat cancer are among the most powerful, and most toxic, used in medicine. They produce unpleasant side effects, such as days or weeks of vomiting and nausea after each treatment. Some cannabinoids relieve nausea and allow patients to eat and live normally. Extracts also seem to benefit patients suffering from multiple sclerosis, although most of the benefit seems to be from people feeling more relaxed when taking a cannabinoid or medical derivative of cannabis. Recent research showed no reduction in muscle spasticity. Claims have also been made for its use in treating: migraine headaches, asthma, strokes, Parkinson's disease, Alzheimer's disease, alcoholism and insomnia. There's increasing evidence that cannabis use is linked to a number of health risks. It damages the ability to concentrate, decreases motivation and more than occasional use in teenagers can affect psychological development. Users can become anxious, suspicious and even paranoid. Heavy use increases the risk of serious psychiatric illness. Users of skunk, a stronger and increasingly more available form of cannabis, are seven times more likely to develop a psychotic illness, such as schizophrenia, than people not using cannabis or using the more traditional forms. Cannabis also interferes with coordination, causing problems with balance, walking and driving. There are other side effects of the drug, but they vary considerably and are less predictable, partly because cannabis has more than 400 active ingredients. They may include effects on the heart, such as increased heart rate and blood pressure, and damage to fertility. People who smoke cannabis are also exposed to the toxic chemicals in tobacco smoke. People may become dependent on cannabis and find it difficult to stop using it, experiencing unpleasant withdrawal symptoms if they do stop such as cravings, agitation, mood changes, sleep problems, appetite disturbance and other symptoms. The debate over the use of cannabis in medicine is highly controversial and emotive. Supporters of the drug claim it has wide-ranging benefits, but opponents say it is a potentially dangerous substance that can actually damage health. The use of cannabis remains illegal (except for prescribed cannabinoids as described above). It is a Class B drug. As a result, the penalties for getting caught with cannabis, especially on repeated occasions, can be severe. A report by the House of Lords Science and Technology Committee recommended the use of cannabis for medicinal purposes. However, the British Medical Association (BMA) did not give the report 100 per cent support and believes only cannabinoids - carefully identified chemical derivatives of the cannabis plant - should be used in medicine. The Government says it will not consider legalising cannabis for medical use until clinical trials had been completed. Occasional users of cannabis may be able to give it up, although they may find it harder to give up the general smoking habit. However, heavier users may need expert help to stop. Talk to your GP or local community drug agency or clinic.